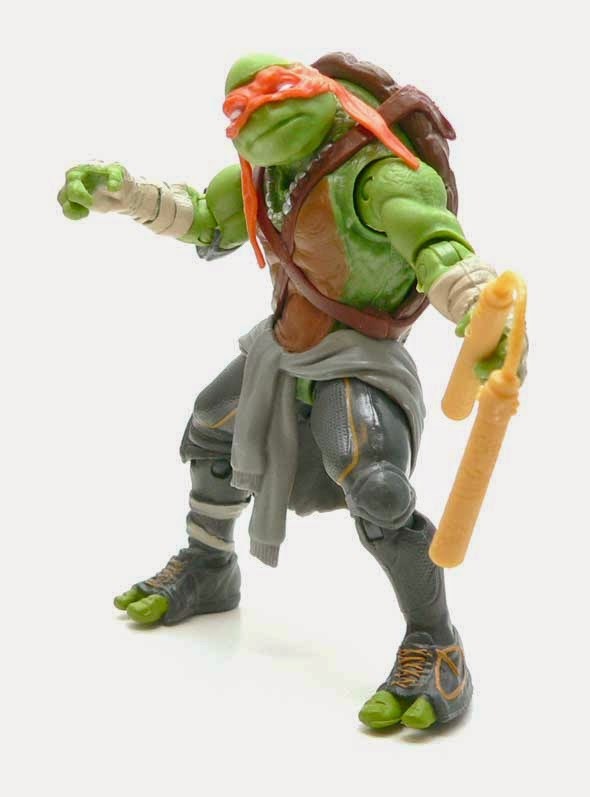 First of all, I want to thank TeenageMutantNinjaTurtles.com for providing this figure for review. They have TONS of Turtle news and information so make sure to go check them out. I was getting some pretty good nostalgia checking out the video game articles. Some buddies and I fed the 4 person arcade game a bunch of quarters in a Slushee induced sugar frenzy one particularly memorable afternoon. Besides various game incarnations and few cartoon episode, I kind of missed the Turtles wave. I've always appreciated the property. I intended to go back and read some of the B&W stuff. It's just never happened. So for somebody like me, the new film isn't quite as controversial as it is for some folks. While there are some aspects of the designs that I may not have chose, I can appreciate putting the Turtles in a modern light. I've been seeing the movie figures in stores and thought they looked okay enough. 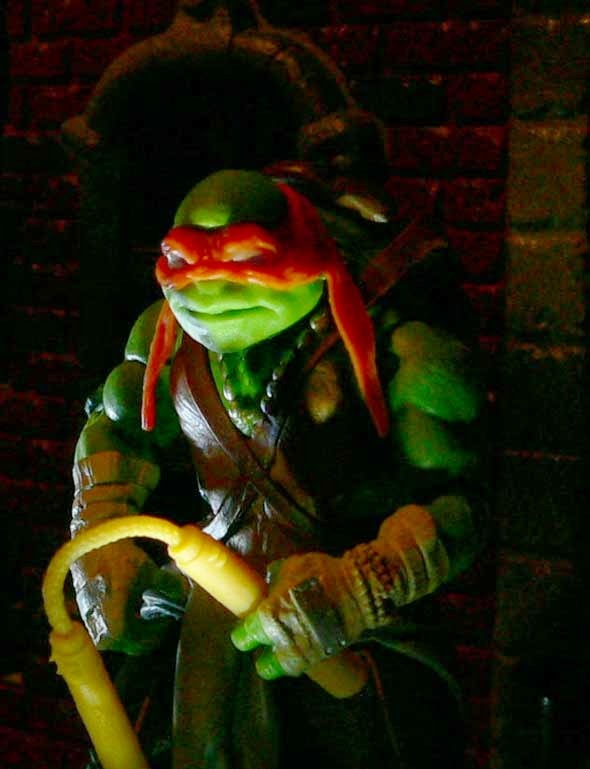 However, when I got Mikey in my hand and really looked at him through the blister, I noticed more texture and detail than my casual glances had picked up on. Well, I know Turtles figures are something that is meant to be played with so I ripped him open. My first experience in hand was a fairly decent one. The figure is solid. No loose joints, and nothing broken. More importantly, nothing felt like it was going to break. Looking at this as a pure plaything, I'd be fairly pleased. He can hold his accessories, has a fair amount of detail, and looks recognizable enough. Honestly, this figure is probably somewhere between a pure kids figure and a collector level figure. The one thing that kids and collectors will probably both dislike is the head joint. It's pegged on with a ball, but is essentially a cut joint. Since his neck is at a strange forward angle due to the anatomy, this really limits the usefulness of this joint. To me some of this looks caused by the shell being a bit too high on his back, but we will have to see the film to confirm that. The shoulders are regular ball joints and not as limited as what I thought they might be. The knees and elbows however aren't double jointed, but single jointed with swivels. They work really well and I was pretty surprised by the poses I could get with them. The lack of wrists and ankles is a bit frustrating, but remember what I said about this being a solid figure? I'm sure that is part of the reason why. The hips are ball jointed, but are restricted by the piece around his waist. 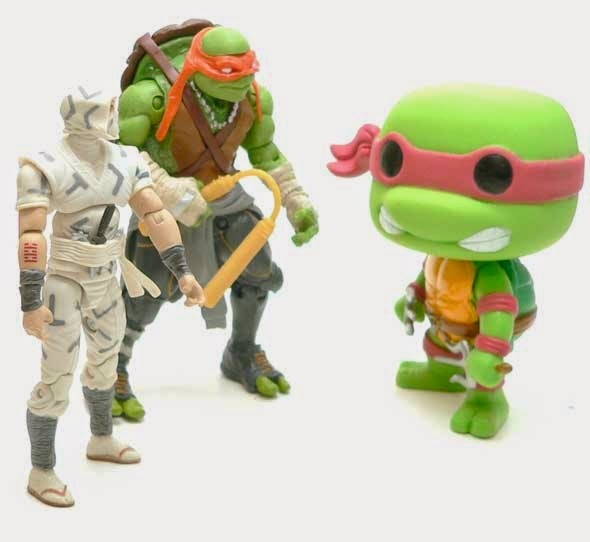 So if you are thinking that Mikey was going to do some ninja high kicks, you might be disappointed. Detail abounds on this guy. There are chains on his neck that are sculpted. I really loved the metal plate on wraps covering his knuckles. I also like the fact they cut channels into the nicely textured shell for the his straps. It both helps secure them and keeps them from sticking out too far. I'm really not too sure about the ends of his mask. Because of the fashion they are sculpted into the piece, they look more like braids to me. The mask is a separate inset piece that otherwise doesn't have really any flaws. The mask does look like it has been changed from its' original intent, though. The way it is painted it has only white eyes showing with no pupils. The actual movie turtles have green around the eyes and pupils. Also, and I'm not sure it my figure or not, the controversial "nose" has been covered up a bit to make it less noticeable. Speaking of areas that need cover up, can we talk? 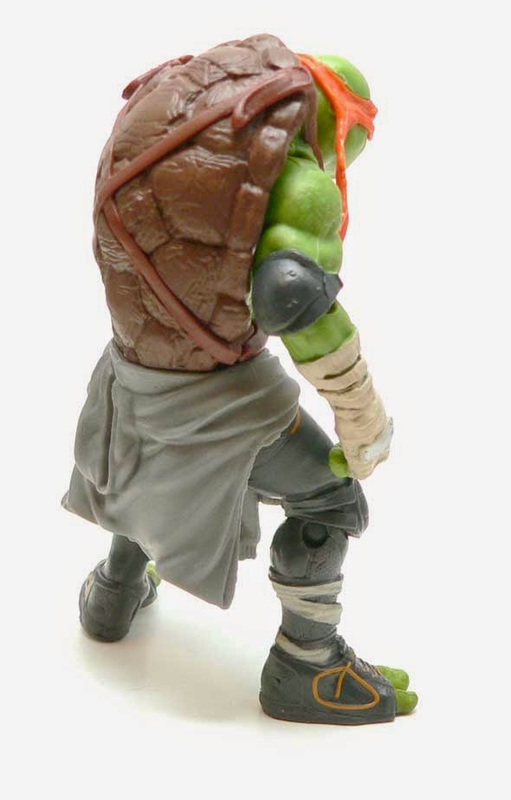 Mikey's midsection is covered up by a hoodie tied preppy style around his waist. And of course, he's wearing some sort of ninja pants causing purists to complain. However, the area of his groin that is not his legs is not painted and shows through as green plastic. This gives the impression that his little turtle is peeking out. I guess he is the party dude. 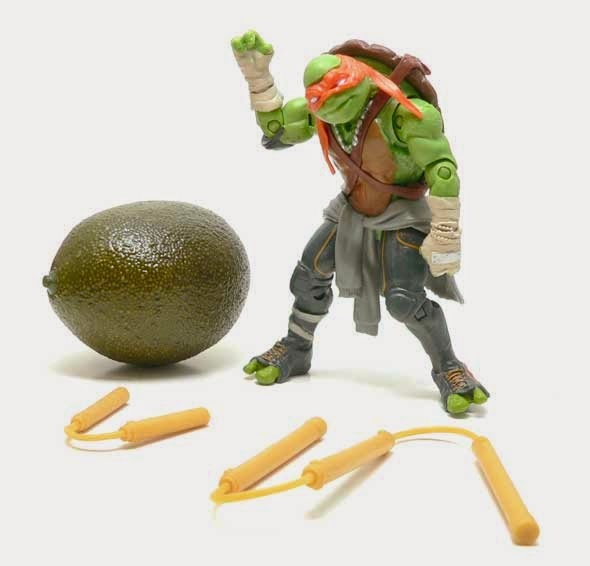 I always remember TMNT figures coming with a bunch of accessories. Here though, we are a bit light. 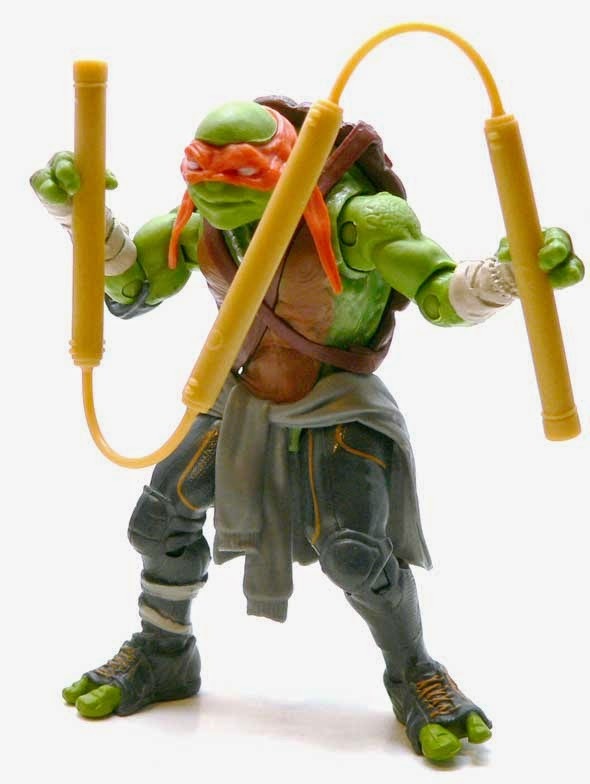 Mike comes with two different nunchuk accessories. One is the standard two handle version and the other has three segments. I'd have like to seen both the same. Also, for a movie figure, I'd have like to have seen some paint on them. 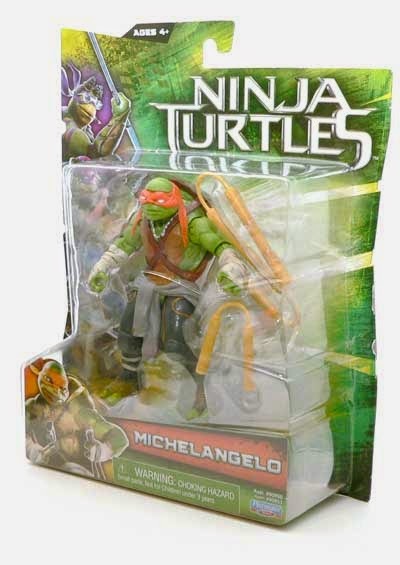 I have to say I was actually pleasantly surprised by this figure of the pizza hungry Michelangelo. It seems like in recent times companies throw just anything out to make a buck on movie buzz. This particular figure doesn't seem to fall in that camp. Sure the articulation isn't perfect and the paint is woefully underdone, but I'm not going to condemn it. There's of range of motion and detail and the figure seems to fill the need for both collectors and kids. Engineernerd Score: 7.5 out of 10 dollies.